RYANAIR AVIATIONS MOST EXPLOITED AIRLINE WORKFORCE .We are in no way affiliated with Ryanair. 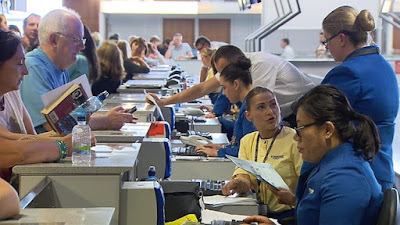 : NEW RYANAIR CABIN CREW PAY DEAL,PAY RISES.NEW ROSTERS-UNIFORMS 4000 RYANAIR CABIN CREW NOT FOR YOU..
NEW RYANAIR CABIN CREW PAY DEAL,PAY RISES.NEW ROSTERS-UNIFORMS 4000 RYANAIR CABIN CREW NOT FOR YOU..
New Ryanair cabin crew deal covers pay rises, new rosters, and funding for uniforms. Now let us look at the RTE report below then we will detail the true information which this report fails to give. RTÉ News has seen details of the new Ryanair cabin crew pay agreement, which includes some pay rises, new rosters and new arrangements for funding uniforms. After issuing a press release announcing the deal earlier, Ryanair refused to reveal any details, saying they were confidential - and declined to confirm whether the same deal would apply at all bases. It is understood the agreement has been structured to boost productivity in order to fund the recruitment of additional staff required to operate new rosters triggered by new regulatory arrangements. From April 2016, higher grade staff, known as Number 1s, will receive an increase of €350 in basic pay and €250 in their "Number 1 allowance". Grades called JCSS will receive a €250 basic pay increase, though the basic pay rises for both grades include what was already set out in a 2013 pay deal. From April 2017, both grades will receive an increase of approximately €450 based on a 50c increase in so-called sector pay on the assumption that staff work the maximum 900 hours per year. From April 2018, they will receive a further 50c increase in their sector pay, with another similar increase from April 2019. There will be a pay freeze from April 2020 unless a new agreement is reached. Cabin crew retain their €400 "Uni-Med" allowance for uniforms, renewal of IDs, and medical examinations. If Ryanair crew accept the deal, contractors engaged through employment agencies will receive a €2 per hour increase by 2019 in four 50c phases. However, that increase will include the planned 40c increase already projected in the 2013 agreement. The airline says the new rosters will deliver 15 more scheduled days off per year per employee, while retaining the same level of annual leave. However, the company reserves the right to schedule staff in the event of operational disruption. It also points to significant promotional opportunities as the airline hires additional staff to crew 300 new planes currently being purchased. Up to now, new recruits paid for their own uniforms, but received a €400 annual allowance to cover uniforms, renewal of IDs, and medical examinations. Ryanair is currently rolling out new cabin crew uniforms. Under the new deal, existing cabin crew who already own or have paid for an old uniform will have a once-off opportunity to receive a new one free of charge - provided they do so by the end of April. Ryanair describes this as a great deal for crew as they had previously agreed that the uniform would be funded by deferring the existing €400 annual allowance. New recruits will continue to pay for their initial uniform, but will still receive the €400 allowance to fund replacement items if they successfully complete their probationary period. Contractors who have already paid for a uniform will have a once off opportunity to replace it free of charge if they do so by 30 April. Contractors currently in the process of paying for their initial uniform issue will continue to pay for their uniform for the first 12 months. Contract cabin crew hired through agencies will also be able to apply for positions on a new grade known as the "Junior Contract" - though the pay rates for this grade are not yet known. They may also get a "discretionary" sick pay scheme and minimum guaranteed flying hours. In some documentation, Ryanair warned that staff rejecting the new deal would remain on the existing agreement, with no pay increases beyond 2016, operating a highly disruptive roster. Let me start by saying No1's (CSS) & JCSS at Ryanair are contracted through Ryanair.This means they work plenty of hours and are paid well.We are talking of only 20% of the 5000 cabin crew at Ryanair. So 4000 cabin crew are called Probationary Cabin Crew (PCC) who are contracted through Ryanair shell companies Crewlink Ireland Ltd and Workforce International.. I will focus of the 4000 PCC in this breakdown below. As you can see from the comment under the photo ''fund the recruitment of additional staff'' as the topic is talking about Ryanair cabin crew agreement the funding of recruitment relates to cabin crew. €3000 each new recruited cabin crew member. Ryanair trainers conduct the training which is a maze. These 4000 probationary Ryanair cabin crew earn Ryanair the big bucks through a per hour rate of pay scam which involves a high termination rate of these new recruits.Go to one of Ryanair's shell companies Crewlink Ireland and see how many recruitment days each month are carried out. .Look at the three comments from a below from a former Ryanair cabin crew member who wanted a Ryanair contract that never came. I am cabin crew for Ryanair for 2 and a half years now. the money is disgraceful. they deducted 300gbp each month for 10 months when i first started. during the winter you are forced to take unpaid leave and have more standbys than flying days and earn at the lowest 400gbp and highest about 600gbp in summer lowest of about 850gbp and highest is usually averaged our at 1150gbp. please don't work for ryanair air, i can't express that enough to people. People ask that question, but the truth is, once you've paid for all the training etc, you are then waiting for the contract, and i was next in line for it, so waited my time out. i would have been doing my CSS (cabin service supervisor) training next month (which meant a salary plus flight pay plus commission. overall better money) i wanted this for 6 months/a year for my cv. but we have now had a meeting about reduction of aircraft in Bristol, so they are now transferring half the cabin crew and 7 captains out of Bristol, meaning i will no longer be doing my upgrade to CSS as they won't need any more for this base. Knowing this, i now am looking at other airlines, along with my partner, as there is nothing for me here now, and i'm fed up of being fed so many lies and utter crap from the company. most people will now be quitting from Bristol base due to the same reasons as me, there is only so much people can take. Ryanair's communications manager Robin Keily not happy to talk about Pilots pay. getting asked questions about Ryanair cabin crew pay deal in November 2015.